If you're a kitchen gadget guru, or just a person who wants to put quick, delicious meals on the table, you must be in love with all the new modern kitchen gadgets and appliances on the market. The air fryer is just one of the ways you can enjoy delicious food with a little help from modern science. The air fryer was first released in 2010 where it got it's start in Europe and Australia before emerging in Japan and North America. The air fryer is a convection appliance, which works by circulating hot air that contains fine oil droplets around the food. The advantage is that it produces food with crispy and crunchy exteriors, much like fried food, but with 75-85% less oil than traditional frying! Plus, it operates at a high speed, cooking foods faster than an oven; French fries, for example, can be ready in less than 10 minutes in an air fryer. Don't think of an air fryer as just a way to cook convenience foods that may already be fried and flash frozen. Rather use it to cook from scratch making your own breaded chicken fingers, sweet potato fries or other delicious vegetables, seafood, steak, chicken or desserts. If purchasing an air fryer, choose the size that fits for your family. Three quarts may be appropriate for one-two people, but it is generally too small to cook for additional guests. Four-six quarts will serve four or more persons. Move over deep fryer; it's time to make room for the air fryer and still enjoy the crunch of each bite. Preheat air fryer to 350°F. In a medium bowl, combine olive oil, balsamic vinegar, garlic powder and pepper. Gently toss Brussel sprouts in mixture until covered with seasonings. 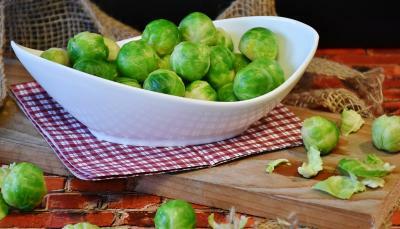 Place Brussel sprouts in the air fryer basket; spray with cooking spray. Cook 5-6 minutes and stir. Cook additional 4-5 minutes. Mix grated parmesan cheese and panko breadcrumbs in a small bowl; sprinkle over Brussel sprouts. Cook 1-2 minutes until cheese and breadcrumbs are browned. So did you get an air fryer to test out?? Still curious about this!